Revisit orthographic drawings by teaching students how to create and present plans for their golf holes. Drawing by Build SF student Jackie Lee. 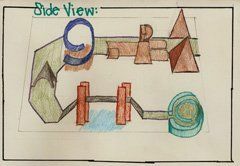 This lesson looks at topics covered in previous lessons -- perspective and orthographic drawings. Ask them about what they’ve learned so far, such as perspective drawing and other key concepts. Have them demonstrate specific skills or lessons on the chalkboard. For example, ask your students to draw a golf hole in 3-D perspective. Teach students how to create three or more different perspectives of their holes on presentation boards. Review some orthographic and perspective-drawing techniques first, then dig into the drawings. Review orthographic drawings and plan, side, and front views. (See lesson 1.) Ask students to practice drawing their holes in these three views on graph paper. Review some important geometry techniques and definitions so that students can label their drawings correctly. For example, go over perimeters, angles, and area. Drawing by Build SF student Jackie Lee. Click to enlarge. Have students design and illustrate presentation boards. 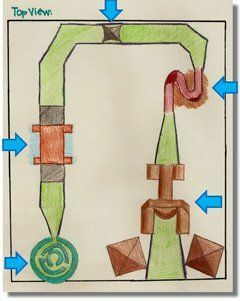 Some students might want to sketch board components on scratch paper first before transferring the sketch to the board. Ask students to incorporate any suggestions by redesigning their boards or by integrating critiques into the next stage of the lesson. 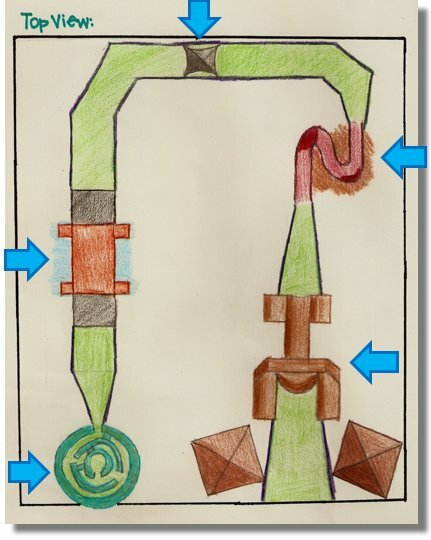 At the end of this lesson, you should have a good idea of each student’s ability to create orthographic drawings, apply geometry skills, and understand the other concepts covered. Here are some guiding points to help you assess each student. 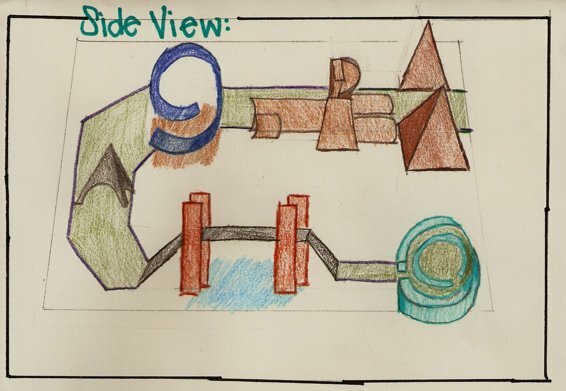 Excellent: Students use balanced compositions to present three views of their hole. They’ve labeled each hole with accurate measurements, and the design reveals an awareness of its real-world application and original thinking via its design or theme. The board is clean, neat, and well labeled. Good: Students present three views of their hole. They’ve labeled each hole with accurate measurements, and the design reveals an awareness of its real-world application or shows original thinking via its design or theme. They’ve labeled the board. Fair: Students present three views of their hole. They’ve labeled each hole with measurements, and the design reveals some awareness of previous discussions, but it is cliché or very simple. They’ve labeled the board, but not neatly or accurately (e.g., it has spelling errors). Poor: Students fail to present three views of their hole. They have not labeled each hole with measurements, and the design is not workable or is especially messy. They haven’t labeled the board or it’s bent, stained, or otherwise damaged. Break up this lesson into different working sessions in which students can develop and improve their boards. Encourage students to incorporate feedback into every step of the process.